In the past, we've discussed the possibility of Apple possibly becoming the first company to reach a market capitalization of $1 trillion dollars. That figure is computed by taking the current stock price of a public company and multiplying by the number of shares outstanding. The last time we addressed this issue, last May, Apple's shares were at $153 and the company became the first to be valued at $800 billion. With its shares now at $176, Reuters computes Apple's current market cap at $893 billion. Apple is just another 12% rally away (a stock price of approximately $197.20 should do the trick). In the past, when it came to market cap, Apple was challenged by ExxonMobil, or Microsoft. Last month, Amazon passed Microsoft to become the second largest publicly traded firm in the world. Now it seems that Amazon and its $752 billion market cap could beat out Apple to be the first company to hit a trillion dollar valuation. To hit the trillion mark, Amazon's shares would have to rally by 33% to $2,063. Surely it would seem to be a cakewalk for the iPhone manufacturer. But while Apple's stock has risen 24% year-over-year, Amazon's shares have soared 83% over the same time period. Amazon is signing up businesses left and right for its cloud service, the Amazon Echo is the most popular smart speaker in the world, and Alexa has become one of the top two virtual assistants. Meanwhile, sales of the premium priced Apple iPhone X appear to be lagging behind Apple's own estimates, forcing brokerage firms to cut production estimates of the device for the calendar first half of 2018. If both firms were to continue the trend that they both have been on over the last year, Amazon would hit the trillion dollar valuation mark in August with Apple joining the club a week later. 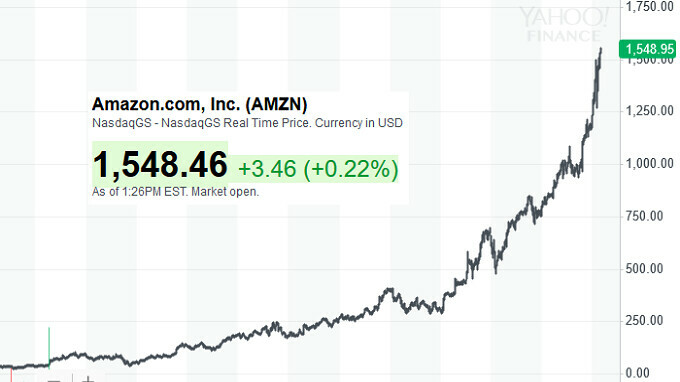 I could actually see Amazon beating Apple to become the first trillion dollar company. Whichever of these two make it there first, the other is sure to make it there soon after. This is not a sprint, I know fanatics see it this way, I doubt Tim Cook is thinking that way. One company is buying growth at the moment, another is growing organically. There is nothing wrong with either approach, Apple could hit the 12% they need by making/announce some big purchases tomorrow, but what will that achieve in the long run? Who said anything about this being a Sprint? Who said there was anything wrong with anyone one of these companies approaches to growth? Your response to me has nothing to do with what I said. What are you, a bot? There was nothing wrong with anything I posted. And it’s funny that a fanatic like you would use the word fanatic when it comes to anyone else. Oh it's perfectly in line with your post. See, if Apple gets there before Amazon, he'd be howling ”FIRST!!!" But if Amazon gets there first, well then it's not a race. And I'm sorry but he's wrong if he thinks Apple isn't buying growth. How many companies has Apple bought in the past 3 years even? I should've bought Amazon stocks when I was in the Marine Corps. Me too. And google. Or even Apple, soon after I got out they announced the iPhone. I knew then that they were going to be big. This was 2001-2006. You could have re-bought your stock after it you knew they were going to be big. Well when Apple release the iPhone Xs Plus this year that will give them a good boost. Amazon just started Wholefood delivery services a month ago and in my area starting this week. So Amazon will grow bigger and bigger when it expand to all major cities, I believe Amazon will surpass Apple. Thank god you aren't in charge of any of these companies. You think WholeFood deliveries is Amazon's ticket to a trillion dollar valuation?! NO. Their core business is. They are diversifying by buying WholeFoods, Ringer, etc is really only going to give them short term boosts. Don't confuse acquisitions with diversifying. Core businesses as a static product will stagnate, especially in the face of a dynamically changing world and evolving markets. Acquisitions do provide short term boosts... but diversifying isn't a short term boost, it's future proofing. It's long term growth through flexibility & adaptibility. Isn't Alphabet the number 2 by market cap? They're still ahead of Amazon so might want to fix that. According to the NASDAQ, Alphabet's market cap is $781.85B... so, yes. Alphabet is at #2. But, that would require this site's authors doing research before throwing articles at the wall to see what sticks. Amazon's been growing a lot quicker though which is where I think they got confused. Amazon is an amazing retailer. On time and correct delivery almost every time, and on the rare occasion the do get something wrong, they fix it immediately with minimal work on my part and zero cost to me. Never any excuses, never any followup issues. Everyone keeps saying first $trillion company but it's not true. PetroChina surpassed $1 trillion in market cap in 2007. Apple would be the first "TECH" company to hit the $1 trillion cap. Then there's Saudi Aramco who if they go public (and it looks like they may) will be worth in the region of $2 trillion to $10 trillion.